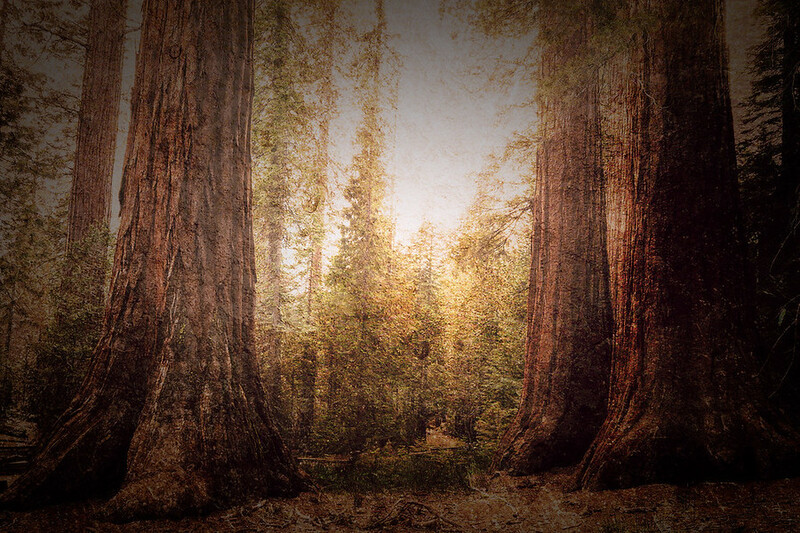 This is an HDR photo taken in the Mariposa Grove which is located in the Yosemite National Park. It's about a half hour from the Yosemite Valley. At some point in your life you've probably seen a small car or beetle driving through a giant Sequoia tree. That tree use to be in this grove until it collapsed. Turns out you can't cut a giant hole through a tree and expect it to live. I guess they didn't realize that in the 1960's. To create this look I used three exposures, each two stops from each other. Combined them to form a single HDR photo in Photomatix then used Photoshop for a bunch of color and I applied a texture that I layered a few times mixing the blending modes between Overlay, Hard Light and Darken.